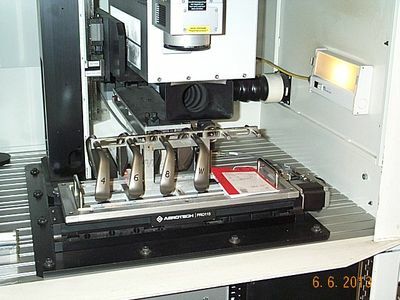 Company News Tuesday, July 23, 2013: Telesis Technologies, Inc.
Telesis laser marking system increases golf club marking productivity by 20%, connects to ERP system to eliminate manual keying errors and associated waste, while cutting automation footprint by 50%. Since before 1984, Ping Golf has been a leader in using technology to create the finest golf clubs on the market and provide the best in customer service. For example, not only does Ping custom fit every club it manufacturers to a golfers unique swing characteristics, it also stores that information in a global database that is retrievable using a unique serial number located on every club head. Should a tree or hidden rock ever result in a snapped shaft or broken head, customers can call Ping, read the serial number to the customer service representative and Ping will make a new club to the customer's custom-fitted preferences and ship it to the customer anywhere in the world. After three years of problems, Ping bought two Telesis Technologies, Inc. (Circleville, OH) multi-head pin stamping machines for full sets of irons, and a single head pin stamping machine for single replacement club heads. "Using the pin stamping system, machine operators would load a set of irons into a custom fixture while another set was being stamped," added Hortsman. "At that time, we were still using electrolysis for the name etching, so it was still two separate operations." Telesis' turnkey stamping machines came with custom fixtures and all associated equipment, and for the next 24 years, the Telesis stamping machines did their job with minimal downtime. "Before 1984, we stamped every iron individually," says Kendall Horstman, Electronics and Communications Manager at Ping Golf Inc. "If the customer also wanted their name on the club, we used electrolysis to etch their name on the club head. Unfortunately, we could use the stamping machines to put the name on the club because we wanted the name to be larger, deeper, and have different fonts available for the customer. And stamping wouldn't accommodate." In 1984, Ping tried laser marking instead of stamping for the serial numbers. "But the laser was down more than it was up and operational," explains Horstman. "The laser 70W YAG from another vendor, but they had a quality control problem with their arc lamps. They would blow in the heat exchanger and it was a major maintenance issue to get it up and running again." Fast forward to 2008, and Hortsman was ready increase productivity by moving to a system that could do both the stamping and the name, and accommodate multiple serial numbers during each cycle. "Up until we moved to Telesis' EV25DS diode-pumped solid state laser marking system, we could only imprint one serial number on each set of up to 12 clubs using the multi-heading pin stamping machines. If we moved to lasers, we could mix clubs and increase productivity," explains Horstman. "We could also get rid of the electrolysis step and combine serialization with writing the customer's name on the club." Ping evaluated several laser marking systems to make sure each system could mark depths of at least 3/1000ths of an inch at the required throughput, including the Telesis E-series EV25DS laser marking systems. Emitting 25W of infrared laser light at 1064nm, the EV25DS includes a red diode positioning light and remote fiber delivery of up to 4.75 meters, allowing the low-maintenance, air-cooled laser system to be located some distance from the work area. In the end, it was Telesis' 24-years of responsive support for the stamping machines, plus the companies willingness to interface the Merlin laser marking software to Ping's proprietary ERP software and customize the laser marking systems motion control to fit Ping's custom's fixtures that won the contract. Ping purchased two Telesis EV25DS lasers in March 2011, and a third in October.